Who says that maxi skirts are only for glam evenings? 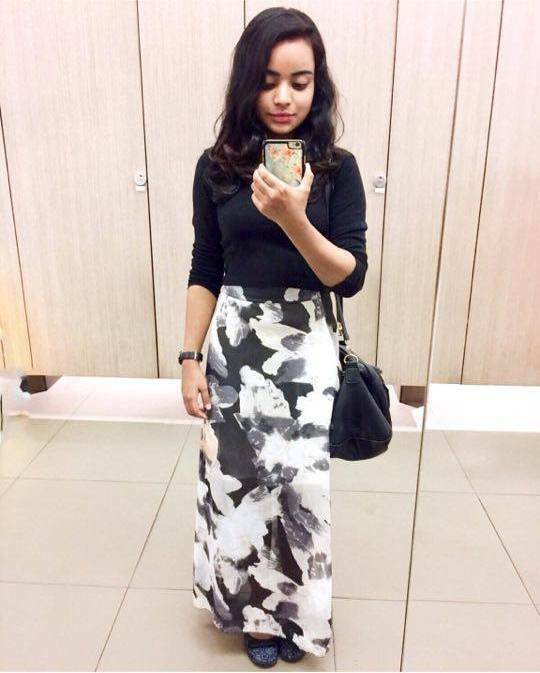 With the hot and humid Malaysian weather, maxi skirts are an essential for escaping the heat of wearing denim jeans. Imagine the flow of wind blowing through the maxi skirt and well, there’s airism that helps beat the heat! You can’t help but feel more flirty and fun with a maxi skirt in your wardrobe! Maxi skirts can be worn all year long so here are a few styling tips to live by. Pair this type of maxi skirt with a classic button down for a sophisticated polished look at work or a client meeting. Beat the common workplace outfit with this ensemble and you’ll be sure to turn heads and make a statement. Get into the romance of a young chic woman on the lookout for daydreams and sweet nothings with a soft pleated maxi skirt. Nothing else screams ultra feminine with a maxi skirt like this paired with fitted crop top and switching things up with a pair of ankle gladiators. Walk out of the house and strut with confidence in a printed maxi skirt. There’s nothing like style elevation with an outfit like this. Pair bold prints or colours with a neutral coloured top and be ready to draw attention like the fashionista that you are. For a bit of an advantage in the maxi skirt game, throw on a wrap maxi and a fitted top for a bit of a grunge feel. For festival goers, a wrap maxi skirt and bohemian top is your cheat way of rocking the chella look without being overrated. Your waistline is important! Remember to accentuate your waist when rocking maxi skirts so you won’t look like you’re drowning in a sea of fabric. Define your waist with a dainty belt, tuck your shirt in, tie a side knot or put on a crop top so you’ll be on top of the maxi skirt trend. Have you decided how to rock on a pair of maxi skirt yet? Get creative and shop maxi skirts online today! Look for different styles, material and length for more variety. Yesss! I love maxi skirts! So tough to find the right cutting though! Great fashion tips for maxi skirts. I seldom wear these, I prefer to wear pants. Great tips to wear my maxi skirts now, thanks! This will definitely help me! So bad at styling and fashion. Thanks so much! BIG BAD WOLF BOOK SALE IS BACK! !